This is the Peru CENFROCAFE from Anodyne Coffee Roasting Co. This coffee comes from the CENFROCAFE Cooperative, a group of about 2,000 small-holder farmers, in Cajamarca, Peru. The small holder farms that this coffee comes from are planted with Bourbon, Caturra and Typica type varieties and are fully washed before sun drying. The result is a medium roasted single origin offering that is hearty, rich, and comforting, with notes of tobacco, chocolate and nuts. First the bag - I love the zip lock and the design, something different from the "usual" bag. The beans - medium roasted and not dry, not oily - perfect. The smell is wonderful with hints of chocolate and sweet smelling tobacco. The varietal mix of beans is great with the majority of the beans from the Latin and Central American region and Typica to round it out. The grind - ground for espresso and the ground beans produce a strong earthy tobacco smell at first with hints of brown sugar eventually. I can still pick up something sweet smelling. Wonderful! As espresso - produces a nice crema, brown sugar in smell. Taste is wonderful - pretty smooth and I can pick up a hint of the tobacco and nut with a caramel after taste. As a flat white - even smoother and a nice microfoam brings out the nuttier hints of the coffee. Anodyne Coffee Roasting Company did a good job with this one and it's a keeper! On paper this sounds great to me - chocolatey, rich, nutty. In reality, the smell is kinda eh and reminds me of meat for some reason. The flavor is OK, not passionate about this one either way. I really enjoyed this. I read that it had tobacco in the taste profile and I definitely got a little of that flavor. Felt like I could have a cigar and drink of cup of this coffee and it would be a great pairing. I try to brew the single origin in a chemex. it came out really nice. Didn't love the chocolatey notes. Not sure I like beans from peru. Holds it own when brewed strong. I enjoyed the nutty finish. This coffee was okay. We prefer a darker, bolder coffee. the note of tobacco is more than a note. An enjoyable cup. Really easy to drink, made me wish the weather was a bit chillier and I was sitting by an open fire - that would have completed the picture! We liked this almost as much as the Topeca Salvador Santa Ana. This was nice, not too bitter, but a strong coffee taste. My favorite of the sample pack. Worked great for me. Well balanced roast. Not as satisfying as some others. A nice flavor. Enjoyed it this morning. The tobacco flavor is unique is worth experiencing. Have one more to try, but so far this is my favorite. Best way for me to describe it is it is a very smooth and enjoyable cup of coffee. Too light, do not like the tabacco flavor in it. A thinner coffee, love how it smells not so sure about the taste itself. Could definitely taste the honey. Good but not great. A nice bit of spice and tobacco as the tasting notes suggest, but didn't blow me away. I honestly didn't think I would like this one, but it wasn't bad. Enjoyed the lighter roast, and I thought there notes blended together well. I liked this coffee and thought is had a good aftertaste, a little smokey. Too light, but the semi-citrusy brightness add a layer that makes it tasty as a casual sipper, but a little too direct and simple. Tobacco present on the end palate which I wasn't a fan of either. Used with a french press and the after taste reminded me of a cigar, definitely picked up the tobacco note. It was good, just not my favorite after taste. The most well-balanced of the sampler box. Medium body. I drink Americanos & Latte Macchiatos, & the flavor was strong enough to shine through. Strong tobacco taste. My top 2 along with the La Colombe Corsica Blend. Nice flavor overall - a bit strong on the tobacco end, but still a good choice, especially for a mid-afternoon cup. Too mild, and beans too lite in color. Guess I'm looking for that bold, full-bodied taste of the coffees we were served in Costa Rica. Very nicely balanced, light with a touch of sweetness. Enjoyed it more while having it side by side with another, drier coffee, as the flavors came out better. not crazy about this one. tastes kind of sour and thin to me. brewed in french press, drank with hot milk and also with hot milk and grated chocolate. did not like either way very much. drinking a pour over now, I like the taste a little better brewed this way. Good coffee, but not enough strength behind it for my taste. Too light. Probably better casual sipping than preparing for a grueling work day. A more flat profile. The flavor is all on the front end. Minimal body. Very unique/interesting flavor. This coffee would seemingly be better not as espresso. Out of the four in the box... This one rates 3rd or 4th. This coffe is fine but we live close to Milwaukee so we have tried it many times before. We would like to sample more coffees from outside our region. Delicious, great mouth feel, intersting flavors, definitely getting the tobacco notes, great coffee. A good all around cup. Everything taste great, just needs to be a little darker for me. Very tasty up front but tended to get increasingly sour as it sat. Expected this one to be my favorite, but it wasn't. I get the tobacco, nuts, and chocolate, but I didn't find this hearty. The water passed through remarkably quickly. Not as bold as I would like but good flavor. Very happy with the smoothness and taste. A little light for my taste, but still a great coffee with a lot of brightness on the front of the tongue, with a sweetness in the finish. Do NOT like this, please don't send this anymore. A very lively cup, nutty, a bit tangy, but also darker notes of chocolate (or tobacco? ), and a sweet finish. It works very well by itself or with a splash of cream. Nice subtle flavor. Pleasant aroma. No bitterness. The first time I brewed this, I loved it. The second and third time, I detected some sour notes and was not a huge fan. Maybe I mixed up the names accidentally? Good coffee! I can tast the nuttiness and to me a little chocolate. Its good alone or with half and half. Has a rounded flavor and it's bold. Like it, but it needed to be more deeper and complex. The best out of the four I was sent. Very drinkable but not weak. Flavors compliment each other instead of overwhelming each other. Tobacco taste was to strong. Didn't finish the coffee because i almost threw up. Rating is based on my personal tastes. I brewed this in Chemex, probably a little faster than normal. The taste is true to the description with strong noted of tobacco, nuts and honey. More tobacco flavor then I prefer personally, but it is a clean cup that would probably be better in a French press. Flavor mellows as it cools off with a bit more acidity coming through in the end. Less smoky and more sour than the LaColombe. Liked it a lot. Excellent blend for my morning taste. on the lighter side of medium, close to Dunkin, which is my standard. Coffee not fresh, would rather drink Folgers Colombian Med/Dark roast. The nut flavor was a little too overpowering for my taste. Good roast....tinge of bitterness that may have been a result of too much coffee for the size pot we made. So again, may be a result go operator error. My favorite of the box set. Consistent and tasty with no weird after tastes. Good for sipping black. Adding even light amount of cream takes away the taste. Nice balanced cup of single origin with decent notes. All of the flavors were wonderful, and I had some left over in the pot, so I saved it and made iced coffee. I really enjoyed this coffee, warm and comforting. Excellent, deep body with lots of upfront, syrupy sweetness. Nice aroma, great balance and just a perfect cup pressed. Not my ideal cup, as I tend to prefer darker roasts and more strong flavors. Although my wife, who prefers lighter roasts and more subtle, fruity flavors, likes this very much. We enjoyed this coffee but it had a strong smokiness that came out in our brewing method. Still an enjoyable cup though. Probably closer to a 3.5. I enjoyed it, just not as much as the mocha Java blend or the El Salvador Santa Ana. It was light, which I enjoyed but overall a little too acidic for me. On the upside, the tobacco and honey notes were quite nice. This coffee is great. It's a coffee I could easily drink every day, because it has great flavor with minimal punches of bright fruit or acidic aftertaste (flavors I prefer to only have here and there, and not every morning). Great cup. This was an OK blend, maybe a little milder than we like. Too light. Good flavor, but am I wrong for loving oily, dark beans? Not light brown, dry ones. **edit. This is also a 4.5/5. When I drop the grind to a more medium (more course) grind. It really brought out the falovor** This is a very enjoyable coffee. Need to dial in the grind a bit more - but the first brew was excellent. I can see this as an everyday coffee too. I am planning on trying the Corsica, mocha java, and the peru cenfrocafe during a morning to see if I can fine tune what i enjoy most among them. Definitely my favorite of the discovery box! I really enjoyed the flavor profile, smoothness, and natural sweetness of this coffee. Very faint aroma. Brewed a little weak for my tastes. Can taste slight nutty undertones, but I did not pick up the chocolate or tobacco hints in the description. Not a bad cup of coffee at all, but I wouldn't go out of my way for one. I was very satisfied with this roast. This tasted too weak for my liking. Love this coffee - it's smooth and tastes very fresh. It was my favorite out of a sample of four. Not a fan. I can't describe exactly how, but the flavor was just not right for me. A great dark coffee that went perfectly with milk--loved it. Not a fan at all. Just not my style of coffee. Smooth taste. A little light on the after taste. Very good coffee. I thought this was a pretty good cup. I brewed it on the Aeropress 18g to 240g (inverted). Very smooth, at least to me. Not terribly fragrant, but I could taste some tobacco here. Strong aftertaste, but I like it. My favorite in the Discovery Box, so far. at first I liked this one, but don't think I care for the tobacco after taste. If you like tobacco flavor give this a try.. I liked this much better than the Topeca in my discovery box, but I still thought the flavor could have been stronger. It also seemed a bit too acidic for me. I got this one in the mail, thank you! I'm so glad I didn't miss out, it is delicious! Like the aroma. A bit too weak and acidic. This was too mild for me. I thought this was a hug in a cup. I generally drink coffee with very bold flavors but I liked this one due to its lightness. A good coffee to curl up with a book to but not jump-start you on a hectic day. Initially smooth flavor but a bit of sour aftertaste. Not decaf as ordered so I could not drink it. Our favorite so far. Great flavor (a bit peety and earthy) and wonderful smell. Too light of a roast for my taste. I prefer a darker roast. Light and crisp. After a few attempts, increasing the amount of coffee I used each time, it never never tasted like coffee. It was like drinking water each time. This is a pleasant but mild cup. It does have nice cocoa undertones but just not quite as bold as I was hoping for. Good nutty flavor. Kinda acidic with a semi-sweet tone to it. I like this quite a bit! I think I brewed it kinda light though. I would like to try more like this. My favorite in the discovery kit. Loved the mellow, nutty taste. A bitter taste with an obnoxious introduction. Weak brew! Please do not send me coffee with tobacco flavors. I feel like you should never send tobacco flavored coffee to someone unless they opt-in for that flavor. Even though it is of the lighter variety, this cup definitely packed a punch, not sure why I got fruity, but I loved it. Although I liked this coffee, it just had a slightly odd flavor to it that wasn't my favorite. I did not like this coffee. It was weak and not strong enough for me. The girind was a light brown color. After the coffee was bewed it was light in color and didn't have much taste. Anodyne, indeed!I've drunk two pots of this, and for the life of me I can't recall an impression.I wouldn't turn down another cup, but grinding and brewing another pot seems almost too much work for what I'd get I dumped the rest of the sample pack in with my Trader Joe's "Joe". Nice change of pace, but not my top choice. Strange taste that we couldn't identify, but didn't like. Very good, nice fruit notes on a long finish. Very smooth, somewhat light bodied. This coffee had a bright, fresh flavor that I enjoyed at first. The roast was a bit light for my taste, and I got tired of it quickly and was ready for a darker roast. Absolutely terrible, tastes like stale cardboard. I through the rest of this out, it was that bad! A little light for my taste, but enjoyed the nutty flavor. Was a little nervous how light the roast was but it turned out to be very good. light, nutty, chucklingly bright. like the flavor and the lightness of the brew. would have again! Not a big fan of this coffee. I will definitely look more into light/medium roast with the brighter notes. It might taste better if not part of the discovery box, which the flavors may have been lost in the long transit​. Enjoyed this on a cold, snowy morning. Has a good balance of body and individual notes. Strong nutty flavor throughout the cup. Brewed with a 16:1 ratio on a V60-02. Enjoyable and comfortable cup of coffee. Liked the nutty taste and wouldn't mind similar notes in future batches. Didn't feel it was anything special though. Used both V60 and french press. This coffee was outstanding! Smooth and delicious, my preferred flavor notes were right on point. I would consider buying another bag! Really enjoyed this. Was a little unsure about the notion of tobacco notes, but it made for a unique and interesting flavor. Pretty average, not bad, but definitely nothing special about it. Great daily blend - mellow, and smooth. Another 4.5. Really close to perfect for my preference in coffee. Definitely pick up on the tobacco. Smooth, and fairly rich. Fantastic flavor, just a little too mild for my taste. I take half-and-half in my coffee and the coffee couldn't hold up... probably perfect for someone who likes black coffee. 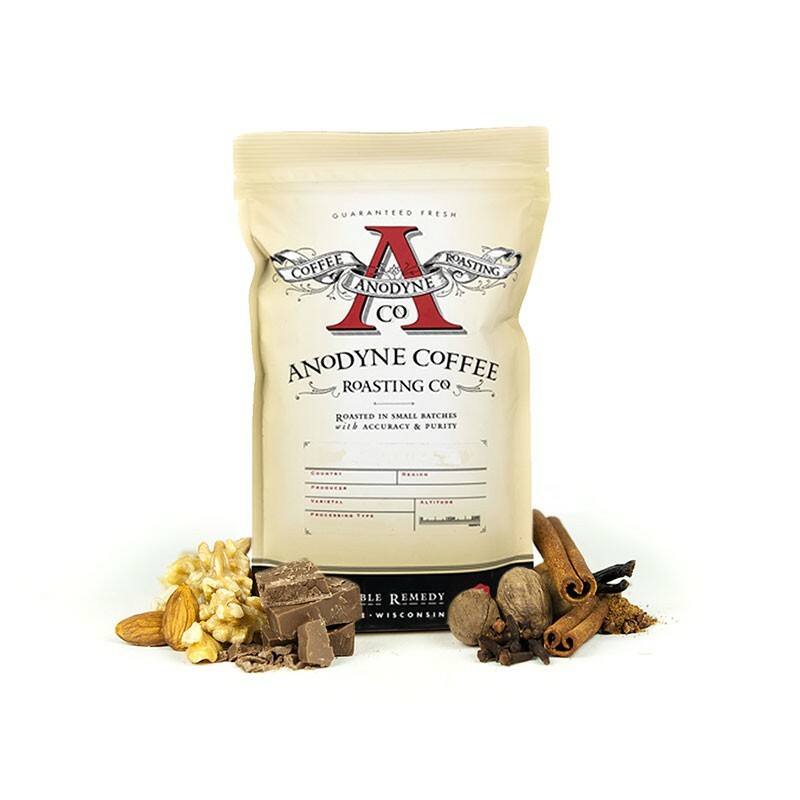 Anodyne is a roaster I've had the pleasure of sampling a number of times. I always have a sweet spot for coffee from Peru and this one was delightful. In this case, the honey notes were well balanced amongst smokey-nut flavors and some how managed to stay mellow and mouthy. We thought the taste was a little blander than we expected for a medium roast coffee. Enjoyed this coffee a lot. Love the boldness with the tastes of tobacco. Enjoyed the back story even more on the single origin with the co-farming. I love anything with that tobacco-y taste, so this was a shoe-in for me. Great flavor, with just a hint of nuttyness without being overpowering. The coffee was flat without much distinct flavors. Great, balanced coffee that wasn't unique or distinguished in any way. What I want to drink on a cold weekend morning. This one was definitely my favorite! I really enjoyed the flavor. I've never tasted "comforting" before, but I'd say this fits the bill. All in all an enjoyable cup. This was definitely my favorite of the bunch. I really enjoyed the flavor and overall taste of this one. The description made me think this was not going to be very good. It had an interesting and delightful flavor. Delicious, deep flavours. On the deep side of character, but not on the dark side. I like this as a mid-morning or early afternoon cup. Weak coffee flavor, bitter. Strange aftertaste. Wouldn't buy it again. I enjoy the earthy tones in this coffee - but it lacks complexity. I wouldn't be totally upset by receiving a 12 oz. bag of this but I'd much rather have some higher caliber stuff. Unique flavor. OK but seemed a bit one dimensional. Was not as fond of this coffee, was very light while drinking but heavy on the tobacco at the end. I did not enjoy the tobacco aftertaste. Smells nutty. Earthy taste; Bit too bitter. I am not a fan of tobacco. Smooth, medium roast. I liked it! Such a great cup of coffee! Well balanced - the description of "comforting" is spot on. Didn't like the flavor much - too weak. Full body for medium roast, but don't care for body. Has an earthy aftertaste. Bland and not enough to capture me. I didn't enjoy the tobacco notes as much as I had expected. Like this medium roast blend a lot. Had high hopes but was pretty flat with a bit of a bitter upturn at the end. I usually like their stuff so I was a little surprised. This was fine. Not bad. Not great. Just not a lot I got from it. This was definitely my second favorite, pretty much I think I like the lighter roasts more than darker! This wasn't our favorite. We prefer "medium-tending-toward-dark" roasts, and this one was too blond-like on the medium spectrum. An interesting cup, to be sure, but not comforting enough to truly enjoy. A fantastic cup of coffee made through the french press. Our favorite cup of coffee so far. It smelled...not so good to me when I ground it, but when I brewed it tasted much better. Not my favorite for sure. This was our favorite of all the coffees we've tried so far. Loved the medium roast. The balance between chocolate and nut flavor was perfect. This is my husband's coffee. He says it is the best cup of coffee he's ever had. He can't wait for more to arrive! Pretty good; a little light, though. WOW! really enjoyed this coffee. it was so flavorful that i drank 2 entire cups without cream. I almost always add cream to my cups because I like the flavor that way. We were both really stoked about this coffee. definitely had the flavor notes you called out, and was a bit smoky, but not a dark roast. So, this one was a winner for us. Im curious to know if this was a medium light or dark roast. Would drink this one again. Definitely the in-between of the Mocha Java and the Santa Ana. It was enjoyable, something I would like to drink from time to time, but lacking some of the richness I prefer in darker coffees. Nutty flavor stands out to me and is undesirable, not for me. Was sour. The tobacco smell is too strong. This coffee had the most incredible color after I ground the beans - such a surprise! While I normally enjoy a darker, bolder coffee, I just loved the flavors of this coffe. A little bitter. Did not get a lot of chocolate in the taste. A nice aroma, but the honey tones were overwhelmingly sweet. My least favorite. Good cup - smells good! Not 100% sure about the tobacco notes. I could definitely taste somewhat nutty base like Topeca's but it was also a lot more bolder. It wasn't as acidic and its aroma right out of the bag was about as strong as Colombe's which was great. It just had a bit of a unique after taste I wasn't crazy about. Hard to put a finger on it but something in this coffee tasted unpleasantly sour. not fruity type of sour. Just sour an unpleasant to taste, experimented with different grind sizes an extraction times but it was still there. On the good side. the tobacco flavor was pretty clear,an sort of pleasant tasting once you get past the sour taste. Granted I couldn't pick up any of the nut flavor that it said it should have, Nor could i taste much honey, but that could be on part to the rather strong sourness an tobacco flavor. Had a good clean finish to it an didn't taste bitter imo. Gotta give it a 3. it was alright but not something id have a second cup of. This was lighter and more acidic than a medium roast to me. This looks like a light roast but this is not mentioned on label. This is a very enjoyable bean. I can appreciate the "nutty" as described in tasting note on label. —No bitterness at all, quite smooth. Not a big fan. Way too much tobacco flavor, overwhelming everything else. Also, a medium roast, not too strong. This is a nice smooth coffee; however I would classify this as a light roast, not a medium. Too light and a slightly bitter aftertaste. I like the dark roasted notes in this coffee. It's a little too heavy on the smokey tobacco side though. If it was a little lighter on the tobacco and maybe a little more dark chocolate or fruit I'd enjoy it more. I enjoyed this coffee very much. I love a nutty taste in my coffees. The medium roast was perfect and not too light. This wasn't bad, but not my favorite. A bit indifferent on this batch. I liked the nutty flavor but it wasn't as bold as I had hoped. I enjoyed the other coffees I received in the discovery box more! Good, just not my preferred style! Loved this coffee! Loved the nutty flavor and smooth taste with no bitter after taste. I didn't enjoy the taste of this one as much as the others, but it didn't have a strong aftertaste, which was nice. hard to say. i didn't receive until a few weeks late. seems fine, nothing amazing. Very average, notes were hard to identify. Tasted generic. Nice flavor but not bold enough for me. Strong and dark, with a nice flavor, though not quite as satisfying as the Corsica Blend. This brews up pretty nice. I like the light/medium roast of the beans.. a little nutty. Favorite one so far. I have yet to try Equator at this point (I'm trying it tomorrow however), but I do like this one quite a bit. Has a flavor profile that I really enjoy, and it doesn't impart a lot of bitterness at the finish. Medium roast, medium body, clean finish. Suitable as brew coffee, does not stand up to added flavors. Not for espresso. Didn't like this as much as the first two in our discovery box. Thin, certainly not special. Unpleasant bitter aftertaste. Very smooth body and taste. Tasty well balanced cup by pour-over. Not too bitter. Nice caramelization. Thumbs up! Least favorite of the group. Not sure if it was to tobacco but guessing maybe so. LOVED this one! Beautiful medium roast, no hints of bitterness, not too citrusy. Perfect cup! I would catch hints of nice flavors in here - sparkly, acidic, spices. The problem was that these flavors seemed faint. Made in a pour-over style I ended up with limpid cups. As a concentrated Aeropress the flavors came to the fore a bit more, but it still wasn't my favorite. This was easily my favorite out of the first four. I got this one int he sampler and it was okay. Not the best, not the worst. I enjoyed it, but not as much as the Mocha Java. Nice, clean, crisp cup of coffee. Compared to tasting notes, I'd say it more citrusy than mellow. I was a big fan of this coffee. I didn't expect it, but enjoyed the tobacco notes. I particularly like the single origin, lighter roasts, with nuanced flavors. This coffee fit the bill nicely. Strong smell and taste of tobacco, which I really loved. Sweet and earthy, very much enjoyed it. Again, this one was a little lighter for me. I've been a Peets fan for awhile now while most of my friends say it's too strong for them. The tobacco tones were a bit much for us. This was lighter than my preference and I didn't enjoy the flavor very much. I will admit I ground the coffee a bit to coarse before putting it in my french press, so the brew was a little weak, but overall, this was not my favorite. Chocolatey and nutty with a light body. It was good. I didn't expect to like it, was pleasantly surprised. The beans and grind smelled great; however the taste didn't make it to the cup. Brewed this as an espresso, but will now try in the drip maker. Slight tobacco a little acidic. Higher quality diner tasting coffee. This coffee is not very exciting. The flavor is very mild, which some would like, but it was too weak for me. This was fine, but nothing special in my opinion. Very bold with multiple layers. The nutty and tobacco notes really come through. Ok cup. Liked the richer notes. this is a clean tasting coffee, with little flavor punch. Good but not intense or subtle enough to be very good. I really like this single origin beans. It's flavorful for a medium roast. I love the complex notes in this coffee, plus the aroma is so wonderful to wake up to. In general, smoky but almost burnt, solidly bitter (but not sour) medium roast coffee. As a PRESS, it smells burnt, and has a hint of "citrus" (I call it sour) and a hint of bitter. Adding Milk & Sugar helps to make it taste a little "woody". As a POUROVER, it tastes almost like a dark roast, still smells burnt, but becomes smoother and you can taste the smoke. Hit it with M&S, and now it tastes burnt, you lose that woodiness from the press. As a COLD BREW, the burnt smell goes away, but the smoky taste becomes amplified, almost too much. It's back to a medium roast and it's bitter but not sour. To me, this is best served as a Pour Over Black. A fantastic flavor. Strong but not strong, with a nice nutty under tone. a little dry and light for our tastes. What a relaxing cup of coffee. May not be strong enough for a morning pick-me-up, but it's so smooth I almost mistook it for tea. If the Mocha Java Blend is my new favorite morning brew, the Peru Cenfrocafe is my new go-to for an afternoon break. Good coffee, would buy again. Coffee seemed weak and was left with a fairly strong bite at the end, especially if enough beans were used to make a bolder cup. Okay, still sour tasting. I usually drink darker blends, but my son picked medium so maybe that is the taste difference. Very smooth, nice balance of acidity, but a somewhat narrow flavor profile. Didn't get the nutty/tobacco tasting notes as described, was more earthy. Could have been more complex. Really complex flavor that I really enjoyed! Surprisingly good! I was slightly intimidated by the tobacco descriptor, but the coffee was delicious! Wow! Was not expecting that. By reading the tasting notes, I was expecting something very harsh and strong. What I got was a nice balanced cup of coffee that was easy to drink. I thought the flavor was delicious. I also liked that it was a single origin, I feel that single origin roast tend to have a more smoother, direct taste then the blends. I like the honey and nutty notes very much. Smooth drinking. Smooth awesome coffee! I enjoyed this one too! A little too light for me. I lake darker bolder coffee though. Great coffee. Smooth and nutty with minimal bitterness. Did not like this selection at all. Had no flavor at all. as a chocolate lover, i liked this one a bunch too....i tasted the chocolate and nutty flavors right away. went great with holiday cookies! This was our favorite. Smooth and nutty and almost sweet - loved that flavor. Really quite rich for a medium roast. Yum! Not my cup of tea. Nothing about the quality, I'm just not a huge fan of the flavor. Not much body or flavor. Least preferred. Didn't provide the early morning needed "jolt." Nice lighter option, better when warmer out! I was excited to try this coffee but was a little put off by the tobacco notes. Smooth and balanced but weak flavor profile. Pretty good roast, I wouldn't try it again but it had a very interesting flavor profile. Delicious! I can really taste the bean in the single origin coffees and this was no exception. The nose on this roast is very nice! This took the most work to figure out – first cup was weak, and a little bitter, but I moved to a finer grind and it improved. Third cup I switched from Chemex to Aeropress and I think that worked out the best. Maybe too fussy, though. Light roasts seem to have the highest upside, but require more fine tuning. Really like the chocolate/nutty pairing. My favorite from the Discovery box. Clean and mellow. I liked the nuttiness and the tobacco note. Really more like 4.5. Liked this one a lot. This coffee was okay.I thought it was pretty standard. I definitely like the smokey/tobacco quality to it. I think the brew was a bit more "homey" because of it (I live in the south, where tobacco houses are everywhere)... I don't think this would necessarily have the same effect on others, though.I would most enjoy this coffee curled up on a couch or in bed, during a Netflix Binge. It's like a blanket for my soul. mellow but lacking flavor unless increase amount used. We enjoy coffees that are a bit more robust and full bodied. Tasted watered-down, flavorless. Not a fan. Too light, too thin. More a fan of darker coffees with mocha, cherry, chocolate tones. Nutty and spicy is how I would describe this. Prefer a darker coffee for the mornings. This would be an excellent dessert coffee maybe paired with a very heavy cheesecake or other rich dessert. One of the best coffees I've tasted in a long time. Well balanced acidity, and a full, round flavor. A bit lighter than we usually drink. Initial taste was bitter. Would not be on our 'return to' list. Tobacco is the main note.First taste is more prevalent.Not strong enough for our taste. My favorite of the samples. A tasty balance of brightness, sweetness, and body. This coffee lands between okay and disappointing. Not terrible, but also not great. Very muted flavors. Lovers of bold coffee would probably like this. I need more acid and sweetness. Slight tobacco note is a turn off. Really enjoying this cup. The tobacco notes are reminiscent of sweet cigar to me, and there's the subtleties of honey comb as well. I enjoy the nuttiness, kind of reminds me of peanut skin or Brazil nuts; but the star of it all is definitely the honeycomb cigar box notes. Not usually what I go for in a coffee (I'm really into Ethiopean and Kenyan coffees that are natural dry processed); but I'm so glad this was selected for me... Definitely dig it! Did not like the tobacco taste. Really heavy on the tobacco and leather - I wonder if I overextracted? Either way, gets a lot better as it cools down. I would give this one a 3.5+. What a wild ride this coffee was. I agree whole-heartedly with another reviewer that this coffee changes flavor profile noticeably as the drinking temperature cools down. The first pass with this coffee, my wife and I had totally different experiences from the same brew! She reported a lot of bitterness that I didn't experience. I brewed it again a few days later and all the notes that should've been there were and we enjoyed it a lot more. Erring on the side of caution, I gave this three stars but if it had been consistently​ what we got the second go around, it'd be closer to a four. Another simple, easy and delicious coffee. Pulled great in our machine, and paired excellently with milk. Chocolatey, nutty, smooth. It was a perfect medium level roast, with a lot of complex flavor that seemed to prefer to be left alone (black)- any additional sweeteners or milk didn't seem to meld well with this one in my personal taste. However, it taught me that overall I like a darker roast, so I think i'm going to update my profile to reflect a darker roast for the next one. This is decent after it sits for a while, but immediately after brewing it I didn't enjoy it much. Taste is not bad. Seems pretty typical. There is a little 'cardboard' taste and bite that I don't like too much. A subtle blend with a round feel. Not one flavor predominant but a soft general nuttiness.